Thank you Nora! Se-tenant 'Viking Heritage' issue with the c.1100 Waterford Kite Brooch. Though Irish in design, this silver, gold foil and glass cloak fastener has Scandinavian design influence. At right is a 10th cent Viking sword from Christchurch Place, Dublin. Thank you Aerling! The cachet shows Brian Boru, the high king of Ireland at the Battle of Clontarf in 1014. Issued: April 24 2014. 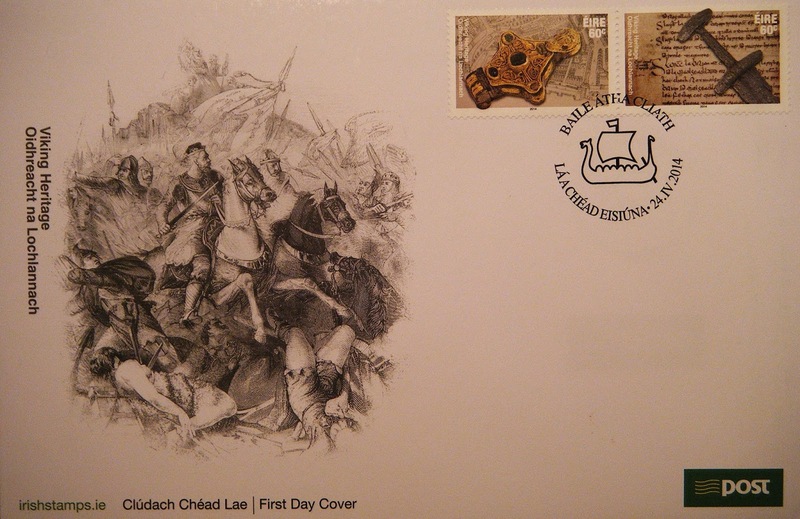 Very nice postcard from Ireland and the FDC too. Amazingly beautiful articles!